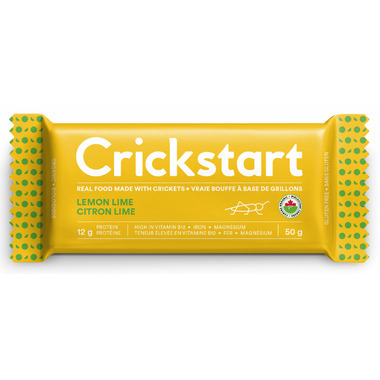 Delicious organic lemon-lime-flavoured bars made with cricket powder. Apart from our star ingredient, these bars are made with hemp, seed butters and essential oils of lemon and lime. They’re rich in texture and very tasty with the kind of flavour you know is natural. 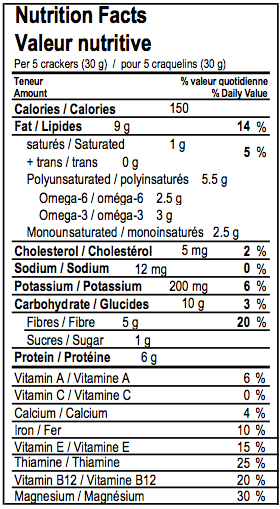 The bars are also gluten-free, include 12 g of protein, and are high in vitamin B12 (unique to crickets). Using seed butters allows us to use less than half the sugar compared to leading energy/protein bars. They make a great small meal replacement or healthy snack and sell especially well when shelved alongside other innovative products or on checkout counters. Made in Canada with Canadian-farmed crickets and certified organic. Ingredients (*organic): *hemp, *pumpkin seed butter, *sunflower seed butter, *cricket powder, *ground flax, *dates, *brown rice syrup, *coconut sugar, *vanilla extract, sea salt, lemon oil, lime oil. I really wanted to like this because I like the concept of nontraditional protein sources but it tasted terrible. I had to drink something with it to get it down. I don't know how much of the poor taste was due to crickets or hemp though. I'm not a picky eater so I don't know how others enjoyed the taste. They are good. Lots of protein and B12. They are organic and it says 40 crickets per bar on the packaging. Just tried this and really enjoyed it. Great post workout and in a pinch at the office. Tastes like a lemon cake. Love this bar! The lemon lime flavour is delicious and they aren't chalky like other protein bars I've tried. Can't wait to try the rest of the products. I tried the lemon lime bar and I found it delicious. Tried this and olive crackers - yuck! An acquired taste. The bar was awful, I had a difficult time swallowing a piece. I guess I won't be switching to crickets as an alternative protein source anytime soon.